Did Mary Reeser Spontaneously Combust Into Flames? When police found Mary Reeser in 1951, she was almost entirely ash. But mysteriously, the rest of her apartment remained almost perfectly intact. YouTubeMary Reeser and her apartment after the fire. Called the “cinder woman” case, the story of Mary Reeser of St. Petersburg, Florida goes like this: On July 2, 1951, Reeser’s landlady Pansy Carpenter dropped by her apartment to deliver a telegram. When Carpenter arrived, nobody answered. She put her hand on the doorknob and found it to be unusually hot, so she called the police. Not much of Reeser remained. There was one slippered foot, which curiously showed no signs of charring, as well as a part of her spine. A piece of her skull remained and was described as shrunken. Though the apartment was very warm when the police arrived, the majority of it remained intact. Plastic household objects near the seat Reeser was sitting in had softened and lost shape. But the rest of the room was seemingly unaffected by the flames that engulfed Mary Reeser. The rug had a scorch mark on it. A chair and an end table in the middle of the scorch mark were upright. Since it requires three or four hours of temperatures around 3,000 degrees Fahrenheit for a body to be cremated, the case baffled authorities. Due to the mysterious circumstances of the case, it’s been suspected that Reeser was a victim of spontaneous human combustion. This is when a person bursts into flames from a chemical reaction in their body, without any apparent ignition of an external heat source. Though there have been accounts of alleged human combustion since 1663, not all scientists aren’t convinced. Chief Cass Burgess was the detective on Reeser’s case at the time. “This fire is a curious thing,” he told reporters. Burgess and his team sent boxes of material from the apartment to the FBI lab in Washington, D.C. for chemical analysis. Some of the materials included a portion of the rug, rubble from the walls, and segments of the chair Reeser was sitting in at the time of her death. The public was infatuated with the case as well. Coroner Ed Silk reported that at least 15 amateur detectives had phoned him with their theories. The detective team put out a statement saying that it was an “accidental death by fire of unknown origin.” Burgess said that it didn’t mean they were concluding the investigation; they were just putting out a release so that a burial could take place. The FBI determined that Reeser’s death wasn’t the result spontaneous human combustion. However, the actual cause does remain a mystery. It is true that human fatty tissue is highly combustible, even more so in heavier people. And Reeser was a robust woman, weighing 170 pounds. While the FBI’s explanation had a certain logic to it, it only provided a partial explanation, as certain anomalies remained. For instance, a pile of newspapers stacked next to Reeser’s chair remained completely unscorched. It’s been almost 70 years since Mary Reeser died. So was it spontaneous human combustion? Give how long it’s been since her death, it seems unlikely the true cause will ever be determined. 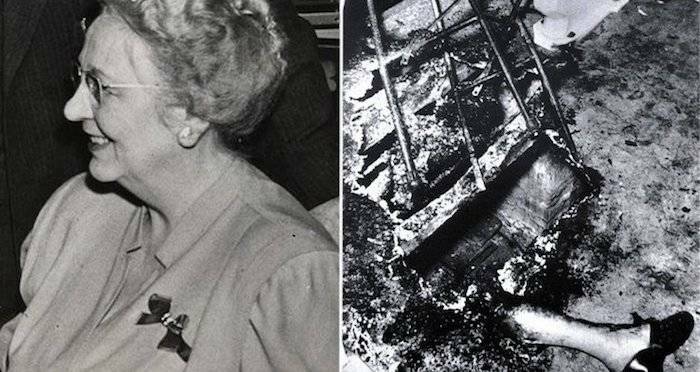 If you enjoyed reading this article about Mary Reeser, you may want to read more about spontaneous human combustion. Then check out the strange story of the real Bloody Mary, the woman behind the mirror.